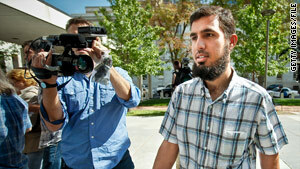 Najibullah Zazi is accused of plotting an attack in New York on September 11, 2009. New York (CNN) -- A Bosnian-American arrested this week in an FBI terror probe pleaded not guilty Saturday to charges of conspiracy to commit murder in a foreign country and receiving military-type training from al Qaeda. The plea was entered in a federal court in New York by 25-year-old Adis Medunjanin. He is an alleged associate of Najibullah Zazi, who is accused of conspiring to use weapons of mass destruction on U.S. soil. Medunjanin is being held without bond until his detention hearing, scheduled for Thursday. He has denied knowledge of the Zazi case. Authorities say Zazi, who has pleaded not guilty to conspiracy charges, planned to be in New York and use an explosive device on September 11, 2009 -- the eighth anniversary of the U.S. terror attacks. Another man allegedly linked to Zazi, taxi driver Zarein Ahmedzay, pleaded not guilty Friday to lying to a federal agent, according to his attorney, Michael Marinaccio. A grand jury indicted Ahmedzay the same day. According to the indictment, Ahmedzay is accused of lying to FBI special agents about locations he visited during a trip to Pakistan and Afghanistan, and about discussions he had with an unidentified man about military training in Pakistan in 2008. Ahmedzay and Medunjanin were arrested this week by the FBI's Joint Terrorism Task Force. Both men, who lived in the New York borough of Queens, had been under surveillance. The FBI confiscated Medunjanin's passport Thursday. That night, he had a traffic accident in which he rear-ended another car, and was taken into custody, law enforcement sources told CNN. Medunjanin was estimated to be going "up to 90 miles an hour" before he crashed into the car on an approach to the Whitestone Bridge linking Queens and the Bronx, suffering minor injuries, a law enforcement source who has been briefed on the investigation told CNN. The source said when Medunjanin called 911 before the accident, he delivered a message in Arabic, which was recorded. It was translated as: "We love death more than you love life." The source said Medunjanin also said "Allah Akbar," meaning "Allah is great." When Medunjanin's attorney, Robert Gottlieb, was asked about the message, he told CNN: "That particular comment had nothing to do with terrorism." "People say things consistent with their upbringing, their background, their beliefs that if you want to misinterpret, you can for your own purposes," the lawyer said. "I have nothing more to say about it at this time."